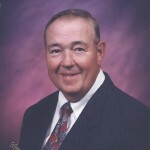 age 85, of Howard Lake , MN passed away Monday, January 14, 2019 at the Buffalo Hospital. He was born March 7, 1933 in Montevideo, MN the son of Margaret and Waldo S. Johnson. He graduated from Mankato High school in 1952 and later attended Mankato Sate Teachers College and Mankato Commercial College. 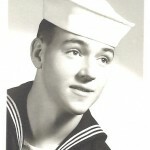 From 1952-1956, he served his country in the U.S. Navy during the Korean War aboard the USS Titania. On August 26, 1961 he was united in marriage to LaDonna Boucher in Eau Claire, WI by his brother Reverend Waldo Johnson. John served his communities as Scout Master in Mankato, Rochester, Milwaukee, and Howard Lake. He served as Justice of the Peace for a time after moving to Howard Lake. John had a passion for the Flea Market, both attending and selling at several of them. He particularly enjoyed the people he was able to meet and interact with there. John is survived by his wife, LaDonna and son, Robert Johnson of Kingman, AZ. He is preceded in death by his parents, and brother, Rev. Waldo S. Johnson.